Everyone knows that flying from just about anywhere in the US to just about anywhere in Europe is a painful event. 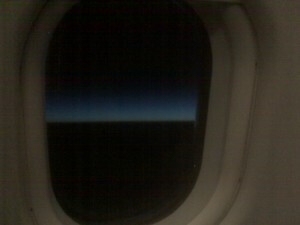 I think that is sufficient to sum up my experience in the air, however I did take a kind of cool moto (mobile phone photo… roll with me on this, I’m trying to create a new word here) of the horizon as the sun was coming up. Something about seeing the curve of the Earth, with a band of light sandwiched between the blackness of space and darkness of night kind of just hit me. Almost the minute after landing, I was working my rear off. I’ve been putting in 16-18 hour days here in Sant Boi de Llobregat, an industrial zone outside Barcelona. I call it a zone because I don’t really see anything here that would make it an “actual” town. As far as I can see, nobody lives out here, there are just warehouses and offices, and a few supporting businesses like restaurants and such. 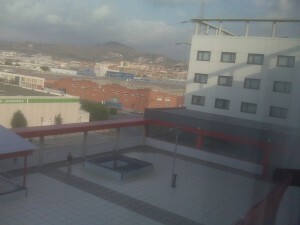 Even so, the view from outside my hotel window still manages to capture that authentic España feeling. One thing that caught me off guard when I arrived at my hotel room is that each room has a special spot for your room keycard just after you get in the door. 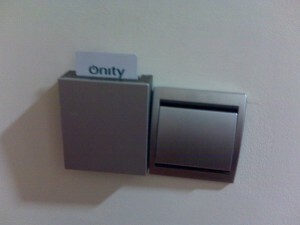 You use your keycard to open to door, then you slide the keycard into another reader slot just inside the door to turn on power to the room. If you remove your card, about 20-30 seconds later the power to your room shuts off. 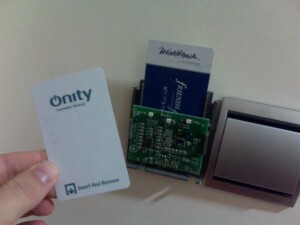 If you put your keycard in upside down or use a different keycard it will refuse to power up the room. It even shuts down the AC in your room to help conserve all the power possible. This makes perfect sense for the majority of guests who leave their rooms unattended all day long, but I would argue for at least one unswitched power outlet so people like me can charge things up or whatever while I’m out. 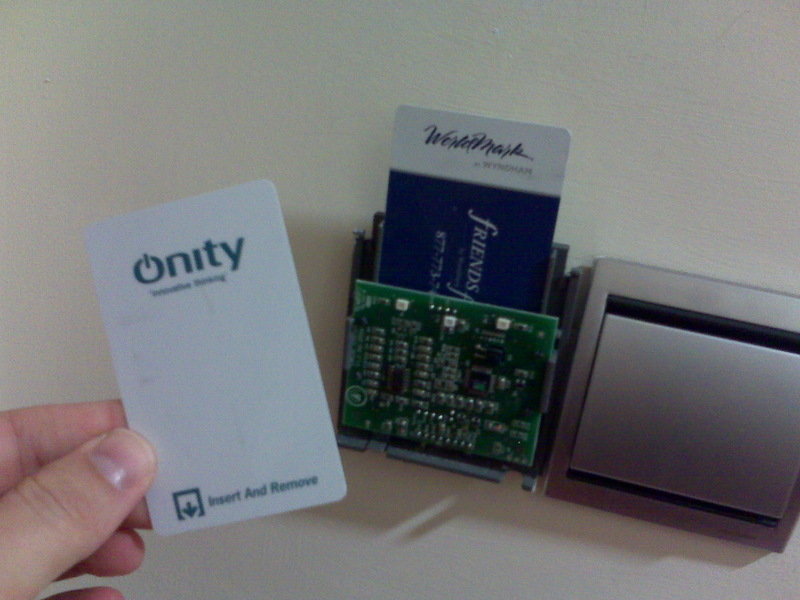 It’s not really a big deal, but I wanted to see if I could get the reader to accept a different keycard and keep the power on. After removing the cover of the magstripe reader, it was fairly obvious I could just slip my keycard in to get a valid read, then slip in another card behind it and remove my keycard and be on my way. It’s a dreadfully simple hack, but don’t the simple solutions prove to be the most elegant? Besides, even though this worked, I don’t really have a need to keep power on in my room while I’m out. I’m also not sure how the hotel computer would handle it if my room key was reported to be in the power controller AND was used to open my room door… and I still have one more night here… so rather than leaving my WorldPerks room keycard I forgot in my wallet from a trip I took months ago in the power controller, I put the cover back on the power controller and put my room key back in the slot. Besides, it’s a convenient place for a room key anyway… no more hunting it down at the last minute when you want to leave the room, and it’s harder to forget when it’s right next to the door handle on your way out. This entry was posted on Thursday, September 4th, 2008 at 7:49 pm	and is filed under Life in general. You can follow any responses to this entry through the RSS 2.0 feed. You can leave a response, or trackback from your own site.